The Edge A-10 celebrates the 10th anniversary of The Edge cigar brand, which launched in 2004 with the introduction of The Edge Corojo and The Edge Maduro. The barber-pole style wrapper pays tribute to The Edge's beginnings by using the same Costa Rican and Honduran wrappers used with the two original lines covering a Honduran binder and filler tobaccos from Nicaragua and Panama. Enjoy the spiciness of the Corojo and sweetness of the Maduro in one tasty limited edition stick! The Edge Habano is a Nicaraguan puro, a first for The Edge brand. 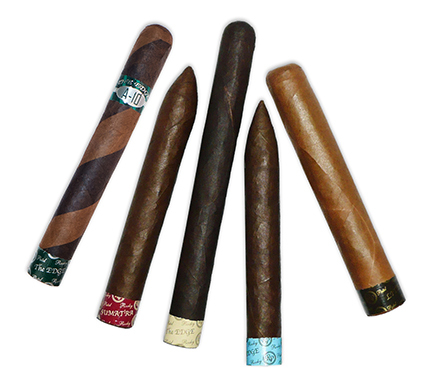 The dark and oily seed wrapper combines with filler and binder tobaccos from Esteli, Condega, and Jalapa to give the Habano a full, rich profile with notes of spice, pepper, and cedar with a long finish. It's also No. 7 on Cigar Aficionado's Top 25 Cigars of 2015. The beautiful, dark Sumatra wrapper of The Edge Sumatra envelops a Nicaraguan binder and fillers from Honduras, Nicaragua, and Peru. The end result is a medium- to full-bodied sweet tasting cigar with notes of wood, leather, and coffee. The Edge Torpedo Lite's bold taste is tempered by an Ecuadorian Connecticut seed wrapper making for a mild and creamy medium-bodied smoke.